People from all over the world have come to stay at the Venetian on Grace Bay, and we’re lucky to call many of these guests our friends. 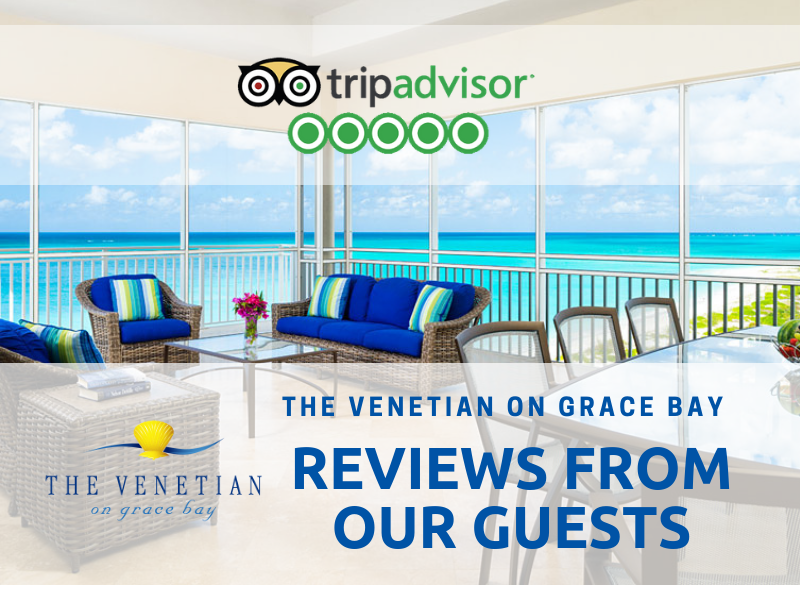 Vacationers at the Venetian on Grace Bay have been very kind to us when leaving TripAdvisor reviews. Here are just a of the nice things they have written. “We had a fabulous time! There was plenty of room for all of us. The condo was beautiful, quiet, inviting and clean as a whistle. Everything you need for an amazing vacation is there. This resort is at one end of Grace Bay making the beach very quiet; it was heavenly. It was great to have a ground level unit so we could all come and go from the ocean or pool to the condo very easily. — TripAdvisor reviewer PEIgirl2018, writing in April 2018. — TripAdvisor reviewer Ohio, writing in April 2018. — TripAdvisor reviewer Rosedave90, writing in April 2018. “From the moment we arrived at the Venetian, we were surrounded by warm, friendly staff, fabulous weather, beautiful water, delicious food, and the best Pina Coladas… Our condo was on the ground floor so we literally walked out the back door to the beach, and the front door to the pool. — TripAdvisor reviewer Cynthia M, writing in April 2018. Late spring and early summer is a great time to plan a Turks and Caicos vacation. The water is warm, it’s less windy and the beach is quiet. From April 15th to August 31st 2018, stay 4 nights, pay for 3, or stay 7 and pay for 5 at the Venetian Resort. Book here. All suites are oceanfront and guests can rent one, two, or three bedroom villas that overlook beautiful and pristine Grace Bay beach. Set on five beautifully landscaped acres offering over three hundred feet of private and Grace Bay beachfront, guests will be impressed by its five star standards in an exclusive and breathtaking boutique setting. Located just 15 minutes from the Provo International Airport, The Venetian on Grace Bay in Turks and Caicos has been recognized as the #1 hotel on the island of Providenciales by TripAdvisor. The Venetian Resort is secluded, yet close to everything.